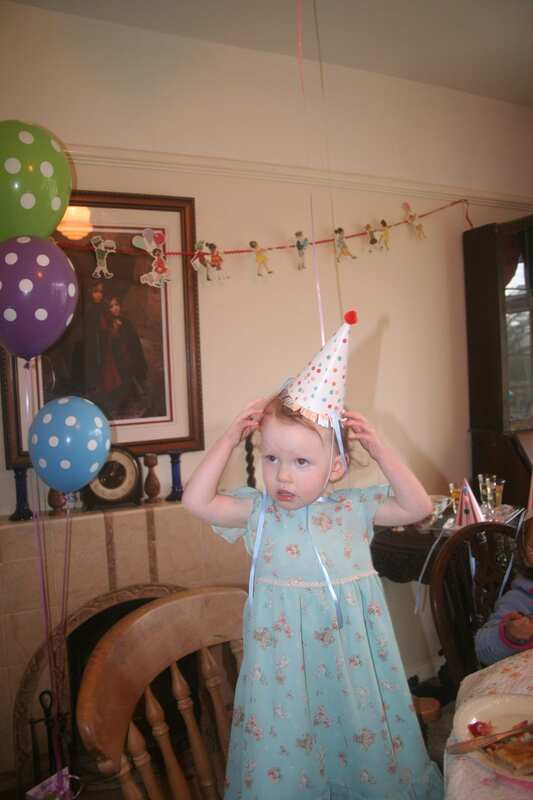 Children’s parties should be all about simple, unadulterated fun. The best memories of childhood parties tend to be of simple jelly and ice cream style events that included good old fashioned fun. In the twenty-first century children’s parties have been catapulted into a whole new level of competitiveness and styling that can cost a fortune, but I suggest that children’s parties should take a trip back in time to period when children’s parties were easy, relaxed and lots of fun. A party should be all about dressing up, eating cake, devouring jelly and nibbling sandwiches (in that order) and filled with laughter and good old fashioned games. After all fun is the foundation of everything our little ones need to have a wonderful day and with a bit of vintage pizazz thrown in children’s parties can be memorable and inspiring for children and adults alike. 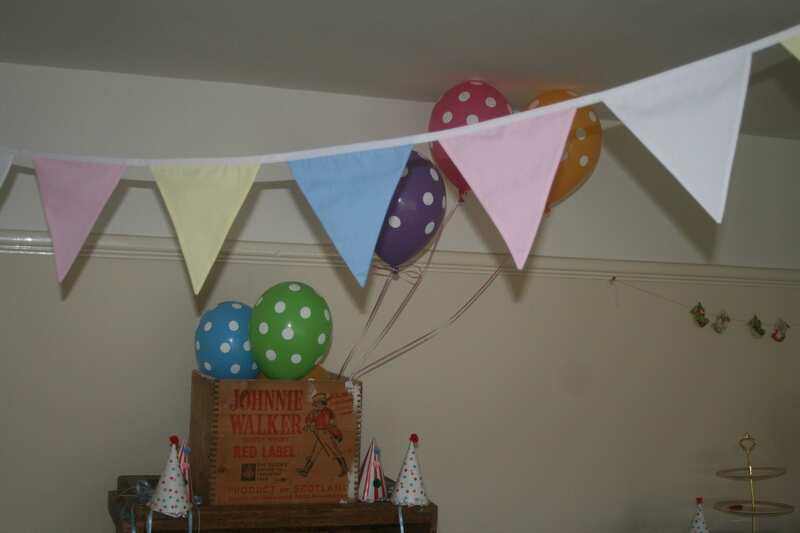 It’s nice to keep the decorations simple, some brightly coloured balloons in primary colours are always a good party choice and bunting has now become such a symbol of parties that it is now a compulsory component, but vintage style banners are also great fun. Mismatched china cups, saucers and tea-plates make for a pretty table display but if you’re worried about breakages then there is some wonderful vintage inspired disposable party ware on the market. I personally like to combine the two using vintage cake stands to hold all the party food, china cups for the jellies and disposable party ware for the children to eat and drink out of, minimising the risk to my precious heirloom china and of cut little fingers. It wouldn’t be a Birthday party without a cake. It is an age-old tradition to light the candles, sing, ‘Happy Birthday’, and tell them to make a wish and let’s be honest it’s a great opportunity to get cute photographs and cake looks, smells and tastes great. As you enter full baking mode in a frenzy that outweighs that of the British Bake-Off competition, spare a thought for the history of the cake. The history of cakes and lighting candles began in Ancient Greece, with the Greeks who made round, moon shaped cakes to honour Artemis, the goddess of the moon. These cakes were often decorated with lit candles to represent the glow of the moon and to promote good luck through honouring the Gods. The first birthday cake was believed to have been made in Germany in the middle ages to celebrate the birthdays of young children and was called the celebration Kinderfest. The cake made for Kinderfest was not the fondant laden sponges we think of today, but a bread-like cake called Geburtstagorten. It is not until the 17th century that birthday cakes with a more elaborate detail of icing, layers, and decorations become fashionable amongst the wealthy and aristocratic. As the prices of ingredients decreased in the 18th century so the price of cakes went down significantly and cake became more available and has steadily gained popularity ever since. If you are making the cake yourself it can be tempting to opt for style over substance and go overboard with the decoration. Remember that this is a children’s party and not a cake competition. The essence of a vintage party should be fun. Children’s party cakes were traditionally simple and childlike, and there is something special about the simple novelty of birthday cakes from the 1950’s and 1960’s with clock faces , mushrooms and rabbits that all have a home-made charm about them. I love some of the children’s party cake ideas displayed in vintage cookery books and there striking simplicity does remind me that birthday cake is all about the joy of eating, blowing out the candles and singing happy birthday. Whether an elaborate masterpiece or a credit to simplicity; remember to leave space on your cake for the candles. Whilst the ancient Greeks are generally credited with the tradition of cakes on candles some scholars believe the tradition started in Germany, where a candle was placed on the cake to represent ‘the light of life’. Usually, the quantity of candles on a cake correlates to the age being celebrated. The superstition is to make a silent wish and blow out all the candles in one big breath for their entire wish to come true. Many believe that if the candles are not blown out in one breath or if the wish is told to anyone else, it will not come true. If you want something a little more elaborate then you could always try making a three tier vintage style topsy turvey cake like the one in the photograph. The specialist topsy turvey tins make this fun cake easy to achieve. This cake was inspired by the colours in a 1920’s flapper dress. 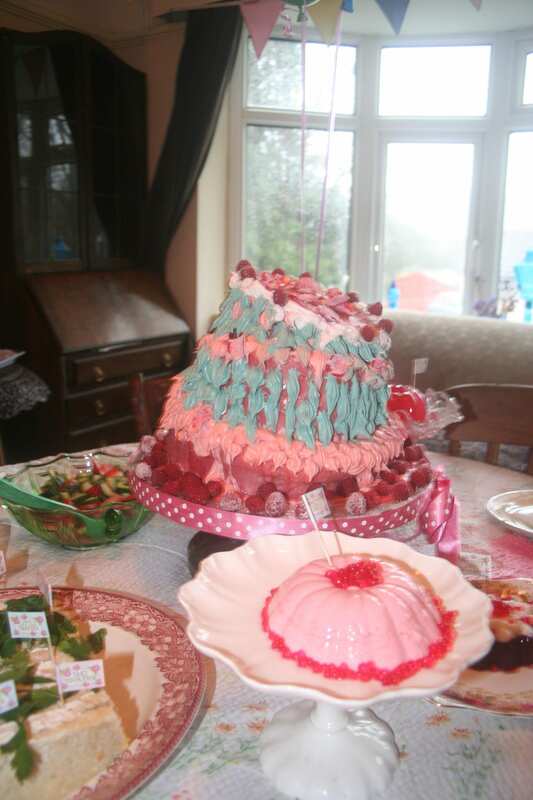 The sponge is a lemon and raspberry sponge filled with lashings of buttercream and decorated with real fruit lemon and raspberry fondant icing and piped with a soft royal icing in pink and duck egg blue, so that it gives a dripping effect reminiscent of the tassels on a flapper dress. Embellished with crystalised raspberries and crystallised rose petals and dusted with rainbow dust in pink candy and baby blue. 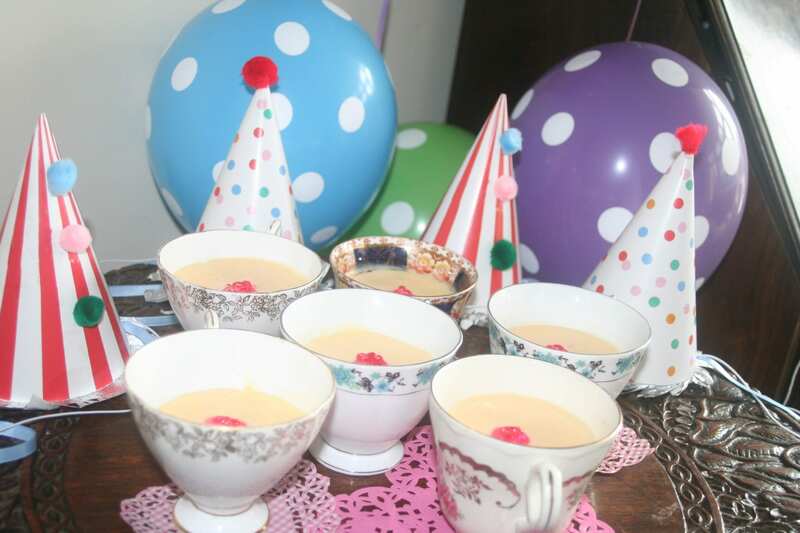 A vintage style children’s party has to include milk shakes, jelly, and ice cream, blancmange and novelty food. There are lots of great vintage party food ideas that are simple to make and prove popular with little folk especially as they look novel and taste great. 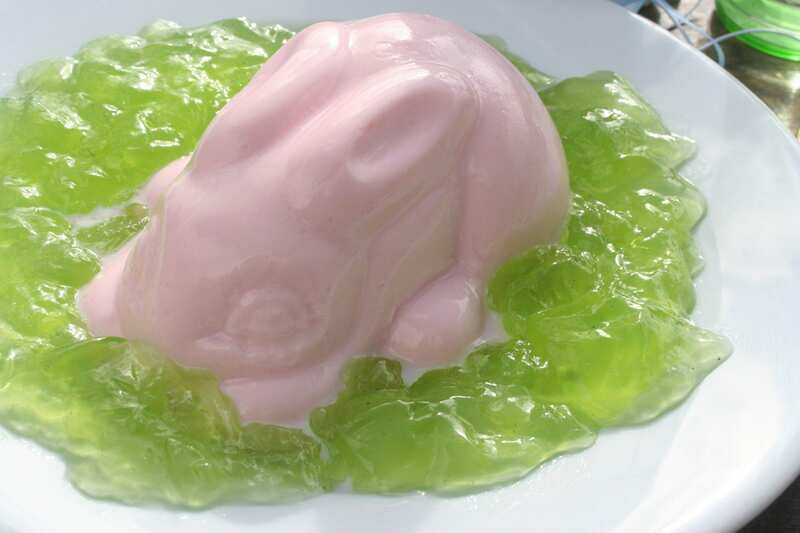 My absolute favourites are fondant mice, rabbit blancmange, chocolate mice, parcel maypole and choc-ice sailing boats. Fondant mice can be made using ready coloured sugar dough and older children love making these during the party, every mouse will be unique and they can take their creations home as an edible reminder of the day. 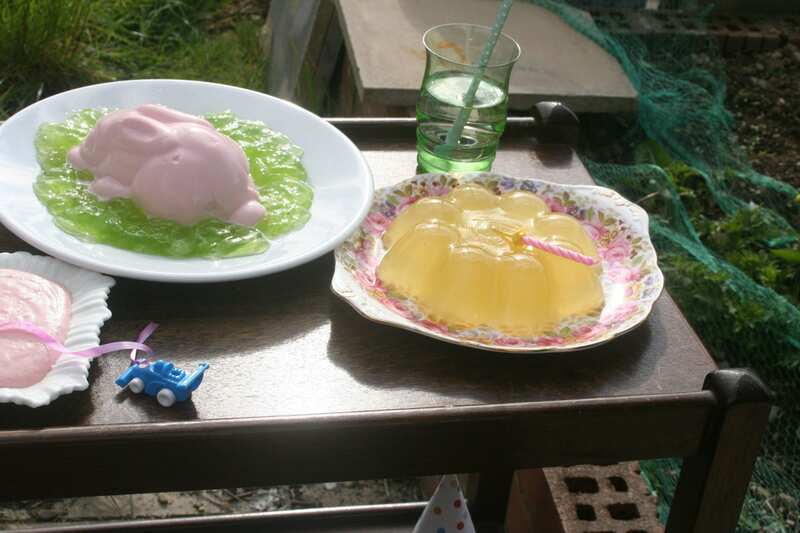 ‘ creams and jellies should always occupy prominent positions on the table at children’s parties. They attract by their prettiness, and, if well made, should be both nourishing and digestible’. Theoretically anything can be turned into a jelly because a jelly recipe is basically, Liquid + Gelling Agent = Jelly. However, before you start flicking through culinary gastronomy books, I suggest you stay traditional and stick with child friendly sweet and fruity versions. Look out for vintage jelly moulds or there are lots of modern moulds on the market that will give a vintage shape to your wobbly delight. Now if you have vegetarian or vegan party guests you may want to consider making a ‘no bones jelly’ and have a play around with some gelatine free setting agents such as carrageenan, these take a bit of practice, so if you need to create veggie friendly jellies don’t leave it until the last minute, practice really does make perfect for this bit of kitchen alchemy. Jellies come to life when they are unmoulded. Unmoulding a jelly can be a cause for celebration, frustration or misery, but theoretically it is easy. To un-mould your jelly place the mould into a basin of warm water until a little of the jelly around the edge has melted and then turn it out onto a plate. Remember where you un-mould your jelly is pretty much where your jelly will stay so think about the plate you want to display your masterpiece on before un-moulding. Divide the rice (this can be coloured with food colouring) between small dishes placing a pear half of top of each dish. Pour chocolate sauce over the top of the pears, place almonds in place for the ears and tails, and serve these hot or cold. There are lots of recipes around for making milkshakes, but I found that mixing strawberry puree with whole milk makes for a delicious additive free shake that the children loved. I added a mix of half Monin Strawberry puree to half whole milk and then poured it into glass milk monitor style bottles. Before filling the bottle with milk shake, dampen the rims with water and dip in a dish filled with hundreds and thousands. Use paper straws for serving. Mix up the instant pudding mix with a pint of milk and set in in a shallow dish. Once set decorate by piping whipped cream around the edge and a little swirl in the centre. Stand a paper drinking straw in the middle and decorate with curling ribbon to make it look like a maypole. At the end of each ribbon tie a small gift. There is something rather retro about choc-ices without doing anything, but once transformed into little boats these form the ultimate in kitsch party food. Make ‘sails’ out of the wafers and insert one in to each choc ice and decorate with little sweets. In a sundae dish alternate layers of chocolate sauce, sliced bananas and vanilla ice cream and top with chocolate sauce and popping candy. With so many sweet treats on offer, getting children to settle down to a savoury sandwich can be a problem at party and this is where novelty sandwiches can be a real asset. Try pinwheel sandwiches for a savoury treat that looks so good it will prove irresistible and will also help to stave off any sugar fuelled tantrums. For a sandwich with real children appeal try making faces with sliced boiled eggs, tomatoes and olives etc. or let the little ones decorate their own sandwiches. 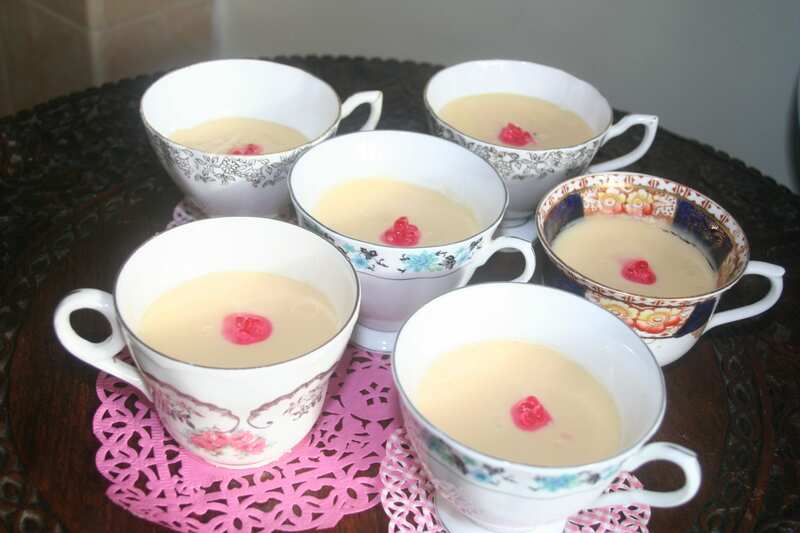 At a children’s party it is important to ensure that the adults are catered for, a simple way is to use vintage tea cups for a grown up gin and tonic jelly or for a touch of creamy indulgence try lemon and strawberry possets. Remember the happier the adults are the more inclined they’ll be to stay and help with the clear up operation when the party has ended. You’ll need six small, pretty vintage china tea cups or some pretty glasses to set your possets in. Place the double cream and sugar in a saucepan over a medium heat. Bring to the boil, and then cook for two minutes, stirring constantly with a wooden spoon. Remove the pan from the heat and stir in the lemon juice, zest and strawberry essence. Strain the mixture into the tea-cups or glasses and chill in the fridge for two hours. Serve decorated with Strawberry Freshburst® Pearls for an unusual twist or decorate with strawberry slithers. It’s lovely to have some lasting mementos from a party, something you can treasure and show to little ones when they are older, my two favourite ideas are a wishing tree and wishing flags. A wishing tree can be made from a few fallen branches (left natural or painted) tied together and secured in a plant pot. Then simply decorate plain luggage tags or make your own tags with the words ‘’my wish for [child’s name] is’’, the party guests can all write down their own special blessings for the child and hang it on the blessing tree. These little tags serve as a lasting memory of the day and are something nice to reflect on in years to come. If you want to create lasting keepsakes and occupy the children at the same time then making wishing flags is one of my all-time favourite party activities that is great to do and always proves popular. Simply cut up an old bed sheet or any old fabric into triangular flag shapes and allow the children to decorate the flags with images and words of the things they wish for, once decorated these can be stapled onto a piece of string or ribbon and strung up in the party room. A party just wouldn’t be a party without games and there are plenty to choose from when it comes to finding good old fashioned fun. There is nothing better than an egg and spoon race. Adults and children alike cheer each other on as they race to the finish line—while trying to avoid cracking under the pressure. Traditionally raw eggs or hard-boiled ones are used, but I like to use eggs that have been blown and painted by the children. There are also some wonderful vintage style sets on the market that offer wooden spoons and eggs in bright primary colours that are great for mess free fun. The egg and spoon race is not only fantastic fun that brings back memories of school sports days but it is ideal for developing hand-to-eye coordination and physical development. Eggs (wooden are great for all ages, but if you are using real eggs then raw for older children and boiled for younger one). Let the competitor’s line up next to each other, each one holding a spoon with an egg on it, with one hand. The use of blue tack and glue and thumbs to hold the egg in place is strictly prohibited! With one hand behind their back, the children race to the finishing line, trying not to drop their eggs. If somebody’s egg comes off the spoon and falls to the ground in an older children’s race, using raw eggs, they’re obviously out of the race. If using boiled eggs you can choose to go with either the rule of allowing the child to pick it up and go back to the start line to begin again (while the rest of the race goes on), or go with the rule of allowing the child to pick it up and put it back on their spoon right where they are, but you must ensure they take their hand off the egg they’ve just picked up and placed back on their spoon, before starting to walk or run again, putting the hand that picked up the egg back behind their back. The first one across the finish line wins and it’s nice to have a prize, medal or trophy. I love the creativity of a dressing up box and it’s wonderful to witness the imagination of children in action, when presented with a trunk full of hats, jewellery and costumes. 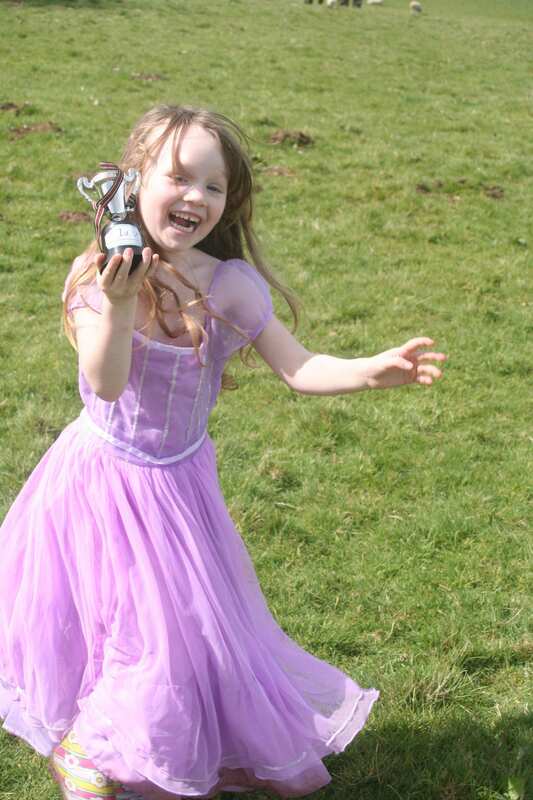 I love the exclamations of ‘I’m a princess’ or ‘I’m the Queen’, it’s an easy activity to set up. You don’t need to fill the trunk with expensive purpose made children’s dressing up costumes, simply trawl charity shops, jumble sales and car boot sales for inexpensive beads, old bridal tiaras, former bridesmaids dresses, masks and anything else that lends itself to being fun to get dressed up in. A sack race is one of those activities that will amuse adults and children alike. Hopping frantically to the finish line in a potato sack never ceases to get even the most timid of children involved and adults can rarely resist the temptation to have a go themselves. 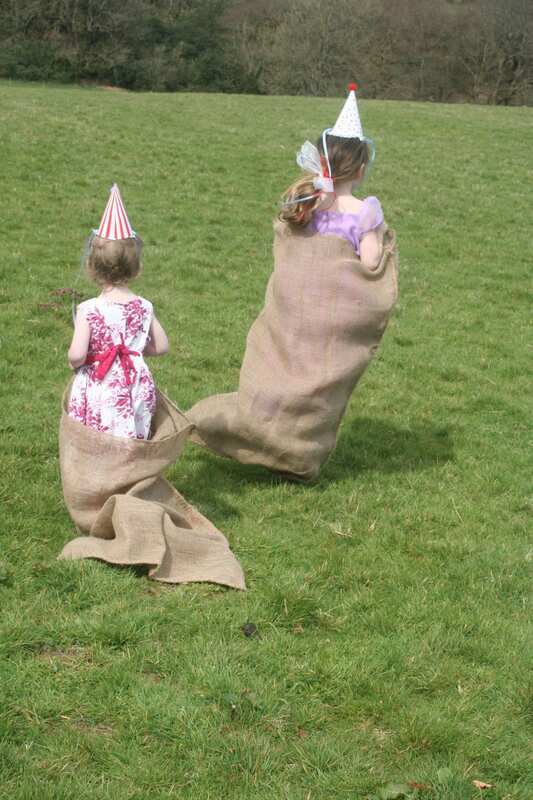 Sack races have a million variations, each one as fun as the next and the great thing is that there is no preparation time needed for this bit of party fun. Potato sacks or large pillow cases for young toddlers. 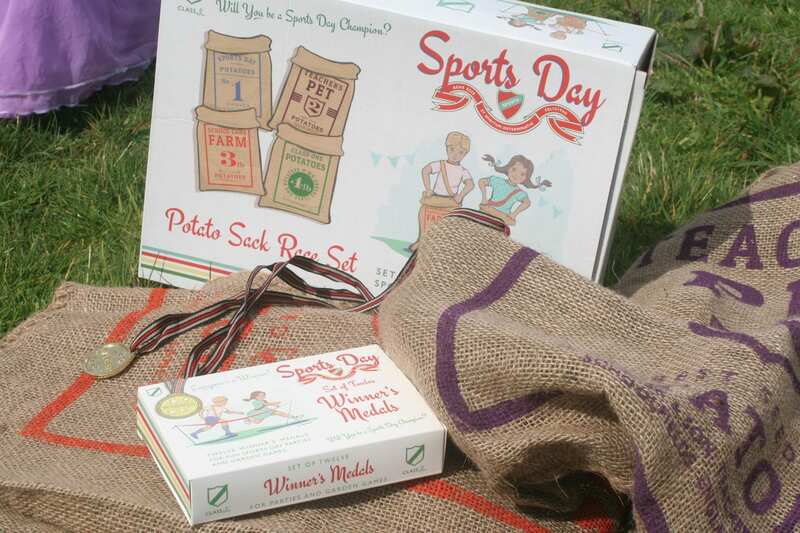 There are now vintage inspired reproduction sacks sold that bring back memories of school sports day. 1. Have the players get inside the potato sack and hold it up by their hands. Get them to hold on to the sack tightly. 2. On “Go!” they will hop from the starting line, to the finish line, and back to the start line to complete the race. 3. The first person to hop their way back wins. After a celebratory cheer to mark the success of the winner it’s nice to give out a small token prize, such as a winner’s trophy, medal or some sweets. If you don’t mind a bit of mess and the children’s parents have been forewarned that that it is a ‘messy party’ then a crazy canvas can be fun to create, this is really a great outdoor activity as doing this indoors will lead to carpets and soft furnishings getting a colourful make-over. 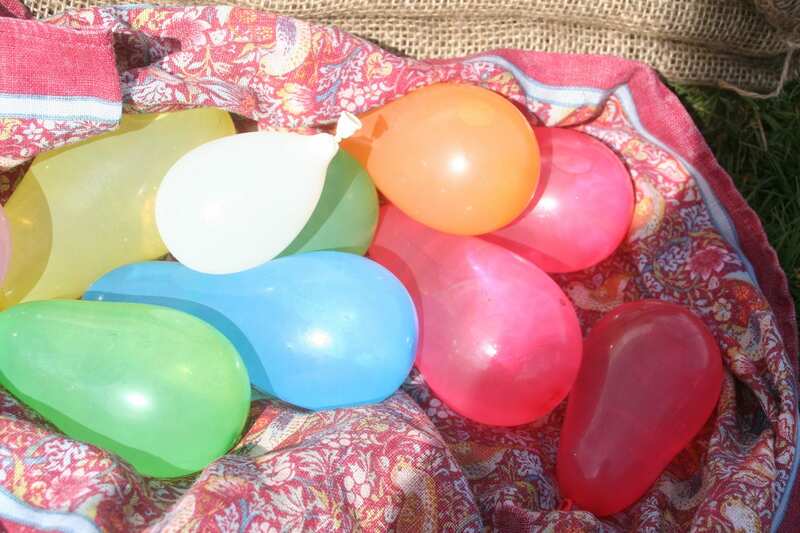 Water balloons are another fun activity especially if it’s a warm day and the little ones can be put in swimsuits to avoid soggy party dresses or just go with the flow. For sugary, sticky mess then making fondant animals, cake decorating or icing biscuits is a great activity that children of all ages enjoy. Whatever, you decide to do to create a vintage style party remember to capture that party fun and that children remember fun and games over styling and snazzy design. Vintage inspired Belle and Boo Tea party range and the wonderful retro party hats that stayed on are available from Party Ark. 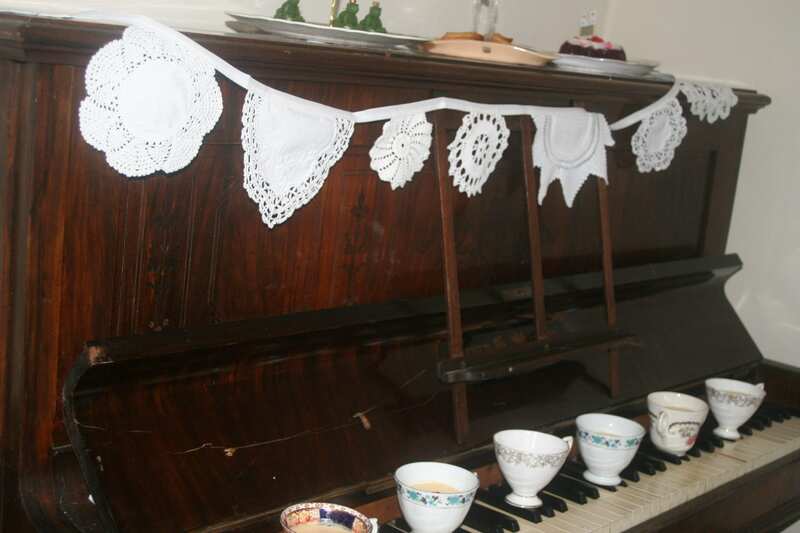 No vintage party would be complete without a few metres of bunting. Sue at Bunting Boutique has supplied the set of Downton Abbey and always has designs in stock, but also makes bespoke pieces to order. 1.5m lengths of the Vintage Paper Bird garlands – £6.00 each. « SHELLY BEACH SNIPPETS No. 33 April 2015.